Dimensions: 4 7/8" x 1 3/4"
These holders are made from sturdy poly resin and finished in a matte silver color. The base is a round disc with a matte silver heart atop. Embossed onto the heart is the message 'All you need is LOVE' with the 'O' in Love formed into a heart shape. 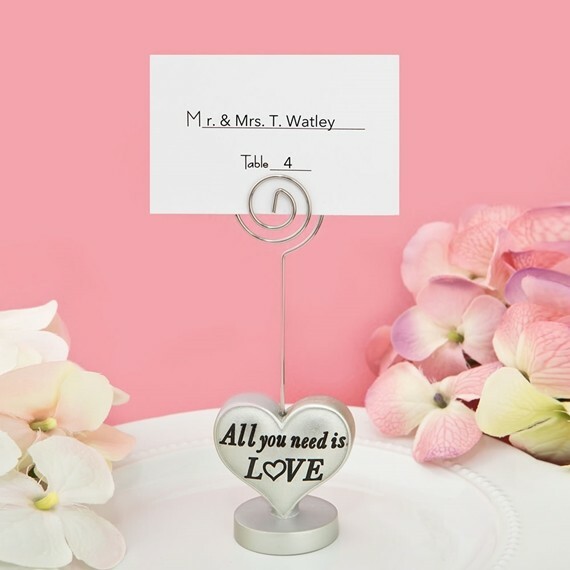 Attached to the top of the heart is a silver metal wire with a coiled top for easy insertion of a photo or placecard. A blank placecard is included. A fabulous favor for Sweet 16 parties, weddings, engagements, anniversaries and any other love-filled event! Bulk-packed. Sold individually.